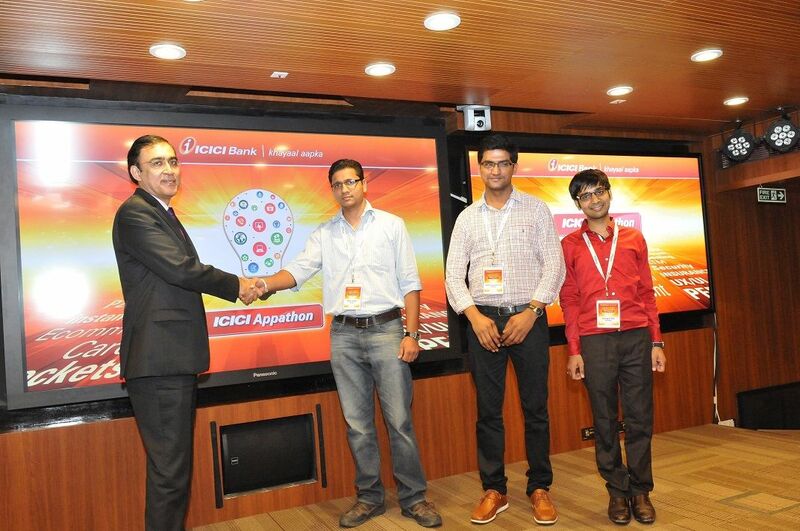 ICICI Bank today announced the winners of ‘ICICI Appathon’, the country’s largest virtual mobile app development challenge by an Indian bank. The ‘Grand Finale’, held at the bank’s headquarters in Mumbai, saw Mohit Talwadiya from Bengaluru, Yethapu Parthasaradhi Reddy from Singapore and Samyag S. Shah from Pune take home the top honours for developing next generation mobile applications. The eminent jury chose the top three winners from over 2,000 participants including a large number of entries from international developers and startups. The bank will incorporate the winning mobile innovations into its digital road map. The first winning application focused on conversational banking based on artificial intelligence and natural language processing. The other winning applications emphasized on enabling payments using digital keyboards and a chat messenger based banking app that uses artificial intelligence and natural language processing to simplify information, respectively. The jury comprised Mr. Rajiv Sabharwal, Executive Director, ICICI Bank; Mr. Anup Gupta, Managing Director, Nexus Venture Partners; Mr. Ashish Kumar, Vice President – Cloud, IBM Asia Pacific; and Mr. T.R. Ramachandran, Group Country Manager-India & South Asia, VISA. All participants were judged on five criteria – uniqueness of the proposition, functionality, business potential, user experience and scalability. The top three winners won a total prize money of over Rs 20 lakh along with a potential engagement opportunity with ICICI Bank. They will also be mentored by ICICI Bank and the partners of the programme, IBM and VISA. Additionally, winners of ‘ICICI Appathon’ will get fast-tracked entry into the ‘10,000 Startups’ of NASSCOM, if they choose to apply for it. Moreover, two members of each winning team will also have access to 91springboard, a community of freelancers, startups and established businesses. As ‘ICICI Appathon’ was available virtually on the cloud to a developer anywhere, participants from across the world took part in it. In India, over 40% of the entries came from non-metro cities like Nagpur, Coimbatore, Bhubaneswar, Jalandhar, Udaipur and Hubli among others. Further, it has also witnessed significant participation from women developers with close to one – sixth of entries from them. Hosted on the IBM Bluemix cloud based platform, ICICI Appathon offered a diverse set of over 50 APIs (Application Programme Interface), the largest set of Banking and Financial sector APIs in any Indian software development event. The APIs were from ICICI Bank and its group companies namely ICICI Prudential Life Insurance, ICICI Lombard General Insurance and ICICI Securities. As a first, payment APIs from ‘Visa’ and the ‘Unified Payment Interface’ API from NPCI were also available for the app development challenge. Participants had to create innovative working prototypes of mobile applications using these APIs. ICICI Bank is the leading player in the Indian mobile banking industry with over Rs 66,000 crore worth of transactions from April 2015 to December 2015 (As per latest available RBI report). It was the first to launch a mobile banking application in India in 2008. iMobile, the mobile banking app, has been recently revamped with over 140 services, the most in the Indian banking industry. It’s ‘iBizz’ mobile banking application extends the proposition to SMEs and corporate customers. The bank also introduced India’s first digital bank on mobile, ‘Pockets’. This comprehensive application allows anyone, even those who are not customers of ICICI Bank to instantly download, fund it from any bank account and use it. ‘Pockets’ is also the world’s first mobile application to integrate mVISA payment solution that enables QR code based payments in the country. It also has a slew of solutions for peer-to-peer payments including those on social profiles like WhatsApp, email, phone and by tapping two smartphones using the Near Field Communication (NFC) technology. In a short span of time, ‘Pockets’ has over 3.3 million downloads; over 75% of them are new to the bank. ICICI Bank recently also unveiled, ‘touch&pay’, the country’s first contactless mobile payment solution on ‘Pockets’ to facilitate in – store payments from smartphones. For latest information on the Bank, visit www.icicibank.com and follow us on Twitter at www.twitter.com/ICICIBank. About ICICI Bank: ICICI Bank Ltd (NYSE:IBN) is a leading bank in India with consolidated total assets of US $ 135.3 billion at December 31, 2015. ICICI Bank’s subsidiaries include India’s leading private sector insurance companies and among its largest securities brokerage firms, mutual funds and private equity firms. ICICI Bank’s presence currently spans 17 countries, including India. Except for the historical information contained herein, statements in this release, which contain words or phrases such as ‘will’, ‘would’, etc., and similar expressions or variations of such expressions may constitute ‘forward looking statements’. These forward-looking statements involve a number of risks, uncertainties and other factors that could cause actual results to differ materially from those suggested by the forward-looking statements. These risks and uncertainties include, but are not limited to our ability to obtain statutory and regulatory approvals and to successfully implement our strategy, future levels of non-performing loans, our growth and expansion in business, the adequacy of our allowance for credit losses, technological implementation and changes, the actual growth in demand for banking products and services, investment income, cash flow projections, our exposure to market risks as well as other risks detailed in the reports filed by us with the United States Securities and Exchange Commission. ICICI Bank undertakes no obligation to update forward-looking statements to reflect events or circumstances after the date thereof. All reference to interest rates, penalties and other terms and conditions for any products and services described herein are correct as of the date of the release of this document and are subject to change without notice. The information in this document reflects prevailing conditions and our views as of this date, all of which is expressed without any responsibility on our part and is subject to change. In preparing this document, we have relied upon and assumed, without independent verification, the accuracy and completeness of all information available from public sources. ICICI Bank and the “I man” logo are the trademarks and property of ICICI Bank. Any reference to the time of delivery or other service levels is only indicative and should not be construed to refer to any commitment by us. The information contained in this document is directed to and for the use of the addressee only and is for the purpose of general circulation only.